1. 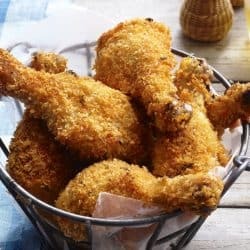 Cut the chicken into bite sized chunks and set aside. Mix the salt, pepper, paprika, onion and garlic powders, and cayenne pepper in a gallon sized zip-top bag. Add the chicken and shake to coat. Refrigerate at least one hour, or overnight. 2. Mix the flour, salt and pepper in a small bowl. Mix the buttermilk and egg in another. Pour the chicken from the zip-top bag into the buttermilk mixture and toss to coat. 3. 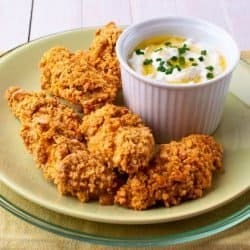 Remove the chicken pieces from the buttermilk one-by-one, and dredge through the flour mixture, tapping off any excess flour. Set in a single layer on a plate. 4. Preheat the oven to 200 degrees and line a baking sheet with paper towels. Fill a heavy, deep skillet with 2 inches of oil. Heat oil to 350-375 degrees. If you don’t have a thermometer, drop a one-inch chunk of bread in the oil. If it bubbles vigorously and browns in about 60 seconds the oil is ready. If the oil begins to smoke, turn down the heat. 5. Fry the chicken in batches, taking care not to crowd the pan, for about 4 minutes on the first side. Flip and continue to fry until the crust is golden brown and the chicken is cooked through, about 2-3 minutes more. 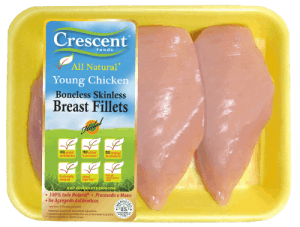 Remove from the skillet and place on the paper towel lined baking sheet to drain. Place baking sheet in the oven to keep the nuggets warm. 6. Toast waffles in a toaster. 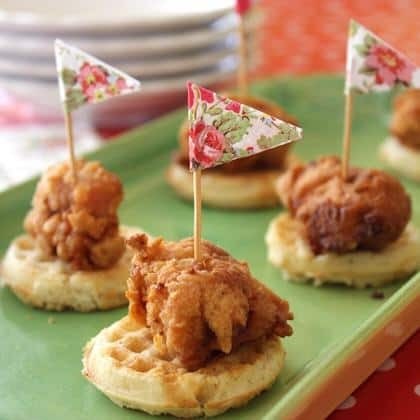 Remove nuggets from the oven and place one nugget on top of each waffle. Secure with toothpicks. Serve immediately with honey mustard or warm maple syrup for dipping.